AGL use coaching, writing and insight to help current and future leaders to be authentic and confident and to communicate their ideas with clarity, whatever the situation and whoever the audience. Named after late founder Anthony Gordon Lennox – whose clients included political leaders and even royalty – AGL realised in 2018 that their brand identity no longer accurately represented the reality of the business or the value of their expertise. Which is where we came in. 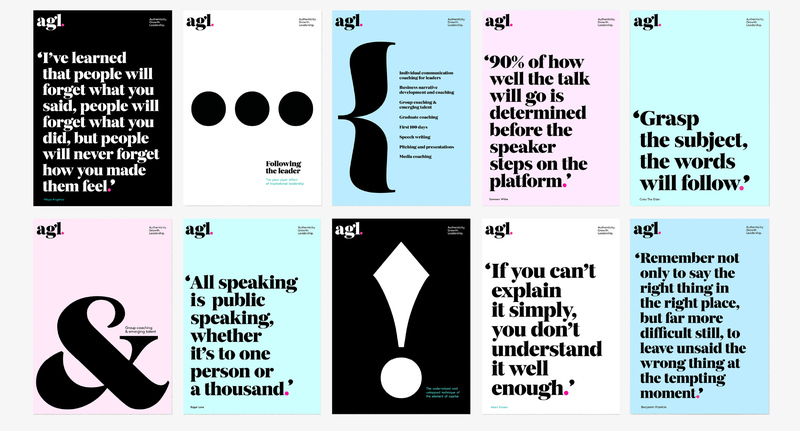 Working with the AGL team to refine and distil a clearer brand strategy, we then set about the creation of an entirely new visual identity, using the typographic language of the spoken word to help AGL to speak clearly, confidently and creatively to their audiences. Thank you to Dan Leatherdale and the rest of the AGL team for having the fortitude and resilience to complete this product under hugely challenging circumstances. And a hearty thanks to animation partner Bobby Dee for bringing the identity to life with such character.